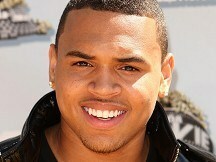 Chris Brown has rewarded an honest fan who returned his Rolex watch after he dropped it at the MTV Video Music Awards. The F.A.M.E singer lost the watch, worth 22,000 dollars, after he dropped it on a trampoline while partying at the awards. But the girl who caught it, named Alisha, has been promised tickets to see Chris perform, backstage passes and a meet-and-greet with Chris. Alisha told gossip website TMZ.com she's "super excited" about the offer - and was never expecting to be rewarded. The fan revealed she was in the audience at the VMAs when Chris took off his watch, dropped it on a trampoline and it bounced towards her. Alisha put the designer timepiece on her wrist, but when she saw Chris' bodyguard looking for the Rolex, she handed it in. The fan then got in touch after a representative for the R&B star appealed for her to get in contact as Chris wanted to personally thank her.